There’s a little city on Prince William Sound in Alaska called Whittier. 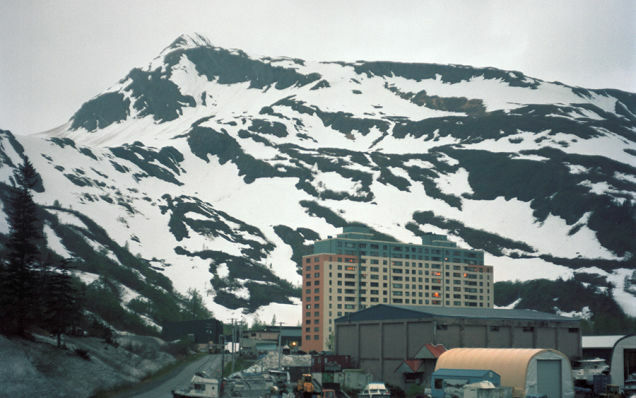 Its population is approximately 200, and of those, 75 percent live together in a 14-story high rise named Begich Towers. But not only do most of the town’s people live in the towers, so do most of its municipal services as well as a laundromat, small convenience store and even a school. The tower stands sandwiched between the sound and a steep mountain range and the views are reportedly astounding no matter which way you look. Only two routes allow passage to Whittier; one is through a 2-plus mile, single lane tunnel and the other is by boat. In winter, boat is not an option, so anyone needing to come and go must wait for the times when the tunnel is open in the direction they need to go. But it’s not just directional vehicle schedules, people must also work around the trains that bring supplies and transport other materials to and from Whittier. Built shortly after World War II, Whittier was the U.S.’s western outpost during the Cold War, and it housed military personnel assigned to that duty. In fact, Begich Towers, and another, now eerily abandoned and desolate building, were built to house the military personnel who were stationed there. Why do I write about this funky place strapped between ocean and mountain where 200 some people live under one roof? Because it absolutely fascinates me, wondering what it’s like, especially during the winter when snow is relentless and winds often blow at 60 mph. What is it like to be inside, side-by-side with the same people day in and day out? Do the people socialize? Do they get sick of each other? Do they get depressed with the weather, their isolation and the long nights of the far north? Nevertheless, I find myself wanting to see what it’s like to live in this precariously unique place, and more specifically, in its tower. I yearn for the safety of a winter spent cozily protected from driving on treacherous roads or schlepping through deep snow and slush. I envision looking out my picture window at a raging blizzard and knowing there’s no place I need to go except the first floor grocery or the gym in the small school where I can practice yoga or do laps around its perimeter. I dream of reading to my heart’s content, of finally finishing my novel and of drinking cup after cup of black tea infused with orange blossom honey. In short, I daydream that all my troubles lie outside the walls of Begich Towers and I remain safely encased in its cocoon. Sigh: a lovely fantasy that diminishes my anxiety as I navigate the ice-covered roads and bone chilling winds of my icy world outside the four walls of a permanent winter prison.